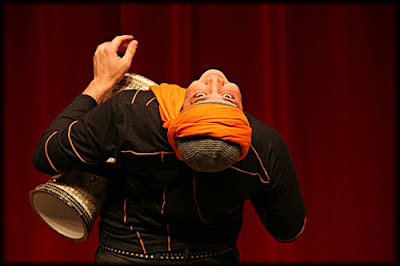 Karim Nagi is a native Egyptian drummer, DJ, and folk dancer. He is the creator of Turbo Tabla, and has released two internationally distributed CDs of this unique brand of Arab House/Electronica using acoustic instruments. 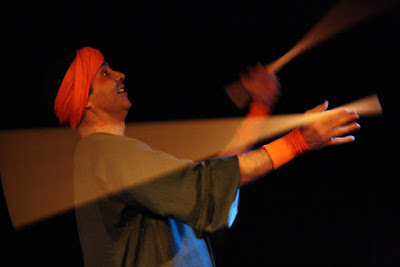 Karim has authored instructional DVDs for the Tabla/Doumbek and Riqq tambourine, as well as two rhythm compilation CDs. He is also well versed in the ultra-traditional styles of music and dance as the leader of the Sharq Arabic Music Ensemble, and the Arab Dance Seminar. 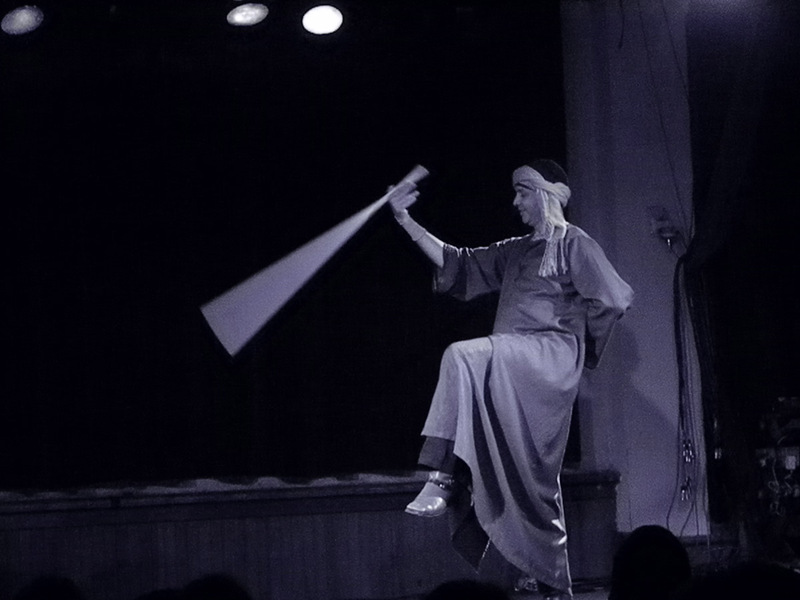 Karim performs and teaches Tahteeb Cane Dance, Dabka Line Dance, and Zikr Sufi Dance. He taught at the New England Conservatory of Music for 5 years, and has lectured and presented at Harvard, MIT, Yale, Bowdoin, Princeton, Stanford, William & Mary, and several Community Colleges. He has recorded music for Bellydance Superstars, Bellyqueen, and the Bellytwins, as well as mainstream artists like Alicia Keys, and The Urban Griot Project. His performances boast a dynamic concoction of live drumming and dance, done in unison. Because of his proficiency in both music and dance, his workshops deliver students to a new physical understanding of the connection between these two disciplines. 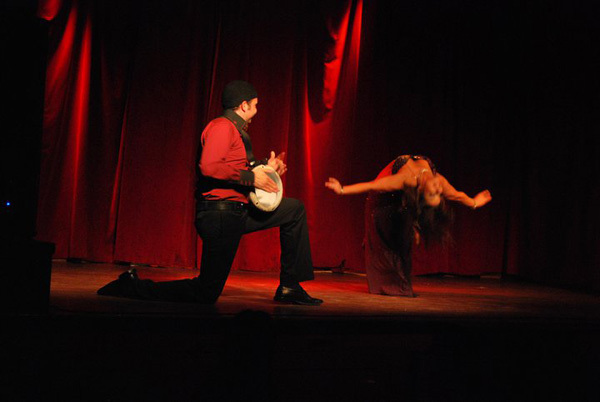 As a dance and drum teacher, Karim has taught in nearly all major bellydance festivals in the United States and Cairo, as well as all major Arab Culture festivals in the USA. 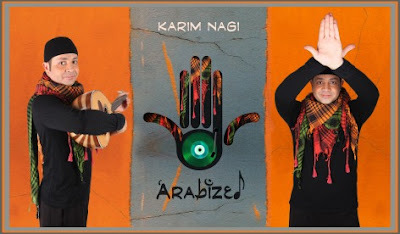 Karim Nagi is a true crossover artist, uniting the Cabaret and Tribal, Traditional and the Modern, the Ethnic and the Urban. - You get introduced many times as a musician, a dancer, a DJ, a remix artist ... etc. How do you describe yourself? Tell us who your Karim Nagi is? I am all these things. There is nothing wrong with a person being multi-faceted. I think many artists are expected to be the same, repetitive creature each time they appear in public. It is great when an artist has variety, and can surprise people. - What's the biggest misunderstanding people have about what you do? I try to be forgiving. People are in a rush. So maybe they don't take the time to properly observe me, or read about me on my website. Perhaps they will see me play the drum, so they will assume that's all I do. Or perhaps they see me as a soloist, and so they don't know that I also play with other musicians or dancers. Because I have a few different skills, and people don't have the effort to observe everything, then they will only get a partial picture. - If you were not a musician, what do you think you would have done in life? - Have you always worked as a musician? if not what were your previous jobs? I also work as a dance instructor. I have taught so many dancers all over the world. 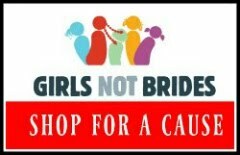 I have also worked in my family's clothing stores, which were all sold over 10 years ago. - How did Turbo Tabla as an idea start? I started as a classical Arab musician. When I worked in the family clothing stores, I used to practice my instruments during times without customers. We always played House/Techno music in the store stereo (the clients liked it). So I would play my Arab instruments along with it. This is how I got the first inspirations to mix classical and dance music. - Where do you think your largest fan base is located and why? I am lucky and grateful to have fans everywhere. They find me in countries I have visited, and those I have not yet visited. I have fans in Asia, Europe, the Americas, and the Arab World. Because of my frequent touring, CDs, DVDs, and internet presence, I have nurtured fans everywhere. - Those who know Said Mrad from Lebanon tend to compare your music to his. I will be interviewing Said Mrad soon and I am wondering if you can tell me what you think your similarities and differences are? Said Mrad is excellent, his remixes are very powerful. I think there are many similarities between my Turbo Tabla songs and Said Mrad tracks, and it is a fair comparison. I think the main difference is that I use more acoustic instruments and he uses more synthesizers. - Many musicians are also singers. Have you ever thought about singing? I love to listen to vocal music more than any other kind of music. Good Arab singers have such an effect on me. So I felt I needed to honor that tradition, and the practice it requires, before featuring my voice. Yes. And I do sing. I always sang chorus for my Arab classical concerts. I also sing for my students in the Maqam for Dancers classes. And my future albums will have more singing. - I've always been surprised that many musicians are not dancers and vice versa but it seems that you are both. Do you find your combination a unique one? how does the musician in you help the dancer and vice versa? I am happy to be both. I feel they are almost the same activity. The music helps propel the dance, and the dance gives energy to the music. Arab music and dance have a similar aesthetic, and motivation. It is an act of Culture when you present multiple disciplines at the same time. - It seems to me that you are quite popular outside the Arab World and very few Arabs actually know about you? why do you think that is? I disagree. I am known in the Arab world, and among Arabs. I am not a pop singer, and pop singers are 99% of the Arab market focus. So if you don't see me among the pop singers, that doesn't mean I am unknown. I am simply in another, less commercial, category. I have performed on the most widely viewed Arabic TV talk show in Egypt, "Al-Qahira al-Youm", as well as the major theaters of Saqiat El Sawy and Madhaf Oum Kalsoum. My CDs have been sold in Virgin Records in Dubai, Amman, and Beirut. My music video "Everybody Yalla" was boradcast on the Arab satellite music video stations of Mazika and Rotana. I may not be a pop star singer, but I do have audiences in the Arab world. Also most Arab institutions in the USA know about me, and I was invited to perform in the Arab World Festivals of San Francisco, Milwaukee, Boston, Detroit, and Philadelphia. - How do you think Arabs perceive your contribution to Arabic music? Arabs have a variety of tastes, based a lot on demographic, age group, and region. I have gotten praise from both the old-school traditionalists, and the new-school urban modernists. But all I care about is that I remain creative, while retaining my roots. - What is your proudest accomplishment so far? My proudest accomplishment so far is that I found livelihood and success without ever catering to anyone, nor compromising my aesthetics. - What's next for Karim and Turbo Tabla? I am thankful that I have the opportunity to create more, and develop. My fans have been very supportive of my evolution and tangents, and I thank them for that. Specifically, I want to write more musical Plays and narratives. I currently have one called "Arabized" and I will develop this concept more and more. - There are a lot of great Arab DJs that compose similar music to what you compose and you have yourself said in the past " I know other drummers that are more talented than me". So what do you contribute your success to? An artist must be unique. You must make a statement, and have a positive effect on peoples' lives. I strive for that. Maybe a drummer plays faster than me, but my goal is to be musical and evoke emotion. Maybe another DJ makes Arab techno, but I can actually play musical instruments, not just machines. When you are unique, you don't need to compete. - What do you like and dislike most about what you do? I dislike when people bypass Arab culture, or simply take what they like from our dance, music, food and clothes, without paying homage to us. - If you had the opportunity to change one thing about the music industry, what do you think it would be? It is changing in the direction I like. 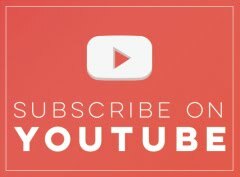 An independent artist now has more ability to have exposure and succeed. It is no longer controlled by corporate tastes, nor narrow-minded commercialists. However I do hope that recorded music does not become free, or lose all its monetary value. - What does your family think about your career? do they listen to your music? do they support your career choice? I do not have any other professional artists in my family. 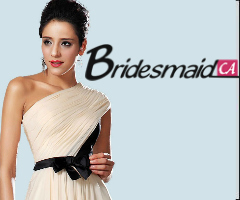 They all work conventional careers in Egypt. So at first they withheld support for my career choice. However now they all support me, because they see that I do everything in a respectable way. They have my music, and because of the variety I record, they all like something from my catalogue. I was originally very shy to share my work with them. But they are very receptive now, including my 2 favorite Aunts, Mahassen (85) and Mouchira (72). They are both, surprisingly, big fans. - How do you get ready for performances and workshops? Stretch. Eat very light. Spend time alone, and avoid the phone. Unfortunately I have a lot of technical concerns with the microphones, tuning instruments, ironing costumes, and making sure the ceiling lights are high enough for my assaya canes. - Do you feel as if you have to 'represent" because you are Arab? do you feel the pressure to represent? if so, how does that affect your music? I do feel I have to represent; and I do represent. But representing does not mean I have to be conventional nor stereotypical. Arabs are completely capable of being unique and contemporary. I feel I need to give a combination of invoking the tradition, while steering towards the future. I am happy to represent my culture. My Arab heritage i what I am most proud of in this world. 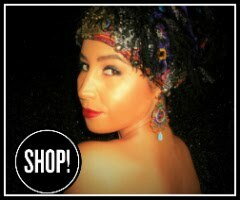 - As an Arab myself, I feel as if American bellydancers put too much emphasis on competition? Do you see that as well? If so why do you think that is and how does it affect the bellydance community here? I personally wish we did not use the term "bellydance". I think it de-ethnicizes the art form. It is an English word, yet it is not an English dance. So I would hope that Arabs like us would help it to return to its roots, both in form, and in label. As for competitions, I have seen it all over the world, including in Arab countries. Apparently people have no other way of quantifying success. I personally prefer a qualitative approach. However I have been a judge many times, on several continents. Perhaps this is a way for me to seek and emphasize the skills and principles I most value. Its can be a way for me to help improve the aesthetics and goals of the dancer. Karim's instructional DVDs are excellent. I had the chance to study few of them and they are a great source for musicians and dancers alike.